After the storm the Shade Anchor is still standing. On Saturday, while the New York Metro area prepared for massive transit shut downs and evacuations in advance of Hurricane Irene, entrepreneur and Jersey boy, John Supino of Buoy Beach LLC, was putting up an umbrella – more importantly, a beach umbrella tethered to his invention, the Shade Anchor™ beach umbrella anchor. The former Long Beach Island lifeguard was proven right when he returned to his umbrella on Sunday, after the storm subsided, and found the umbrella and Shade Anchor bag virtually undisturbed. "The umbrella stayed put. The Shade Anchor prevented it from blowing away, even as the state of New Jersey experienced wind gusts exceeding 70 MPH," says Supino. New Milford Swim Club lifeguard manager, Jason Schlereth, was on site when Supino set up the Shade Anchor wind test. “I was laughing. I thought he was crazy – NOTHING would hold a beach umbrella down in a hurricane! I mean, this was an OPEN beach umbrella, not folded up – that’s a prime target for high winds,” said Schlereth. “I couldn’t believe my eyes when I went back on Monday and, sure enough, this guy’s umbrella was still standing . 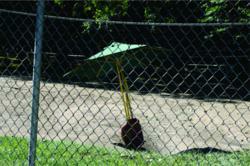 The grounds were locked up and no one would have been able to get in to tamper with the umbrella or anchor. I’ve never seen anything like it,” Schlereth added, shaking his head in disbelief. Buoy Beach LLC was incorporated in November 2010, inspired by the invention of the Shade Anchor™ by its founder, John Supino. The company is working on the development of a line of beach accessories that will complement the Shade Anchor.